Love and weddings can make you do some expensive things, like purchase a $1,000+ wedding dress you’ll only wear once. While there’s no doubt your wedding day will probably be one of the most exciting and memorable days of your life, you’ll need to determine how much you want to spend on your attire for that one day. When I got engaged last year, I knew I wanted to wear a beautiful dress that represented my unique sense of style. I then realized that wedding dresses didn’t come cheap, and I didn’t want to be like the women on the popular television show Say Yes to the Dress who literally drop thousands of dollars on their wedding gowns. To add insult to injury, I went to a local bridal show and ended up winning my fiancé a free tux rental and a very nice discount for all his groomsmen. While I was happy to have won a contest, I couldn’t help but feel envious that my fiancé just had to buy some nice socks and get a $20 haircut for our wedding day, while my entire outfit would probably cost over $1,000. Statistics from The Knot indicate that brides spend an average of $1,281 on their wedding dress. The worst part is I read that some brides are actually willing to pay even more than that. On the contrary, saving money on your wedding dress can actually relieve a lot of financial pressure since choosing a dress is only one of many expenses a bride has to budget for. What Goes Into Your Wedding Day Look? Everyone wants to look their best on their wedding day. For the bride, finding the perfect dress that makes her feel happy and confident is only the beginning. When I found out how much my whole wedding attire could cost me, I practically wished I could just rent my wedding dress like my fiancé was able to rent his tux. While I ultimately decided not to rent my wedding dress, I still think it’s an option worth exploring for any bride who wants to save money on her wedding attire and avoid spending thousands of dollars on her dress. Save Money – When you rent a dress, you are most likely spending a lot less money than you would be if you had to purchase it. If you have your eye on a particular wedding designer’s line, you may be able to rent an expensive dress for $200-$400 or less. Extras May be Included – When you rent a gown, the rental company may include extras like a slip, shoes, jewelry, and veils to go with your gown. Being able to order all of these items at once can be less of a hassle if the price fits. Low Maintenance – As long as you can keep your dress in one piece during your wedding, you won’t have to worry about storing the dress or preserving it after since you can just return it and go about your way. If you’d rather hold on to the memories of your wedding day and cherish all the photos, without having your gown around the house creating clutter, renting your wedding dress may sound like a great option. Limited Selection – One of the biggest drawbacks of renting your wedding dress is that the selection can be very limited. 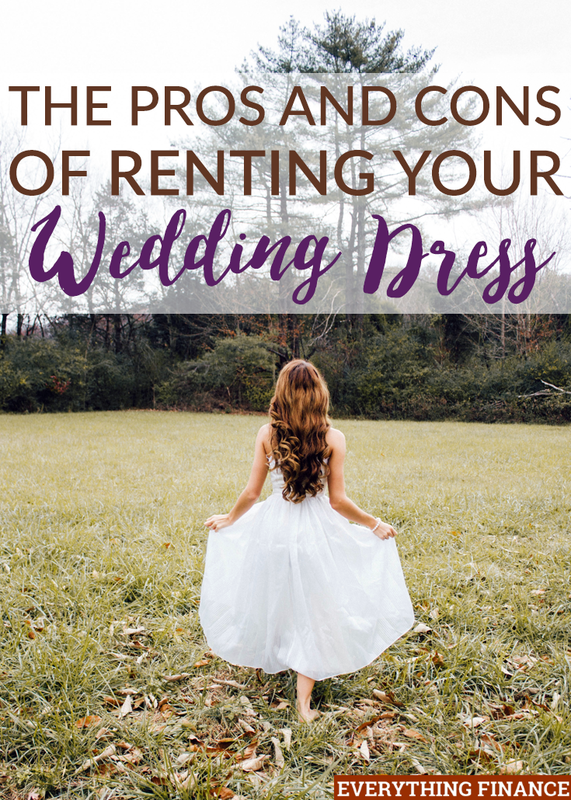 If you are extremely particular with what you wear or have a specific style in mind, and can’t find it after looking through a company’s inventory, this may deter you from wanting to rent your dress. You also have to consider that some wedding dress rental companies may have older styles since wedding fashion changes almost every year. Size and Customization Constraints – When renting a wedding dress, you’ll also have to worry about finding one you like in the correct size, which could be a challenge depending on where you look. It also doesn’t help that you can’t alter or customize the dress as you please since someone else will be wearing the dress after you. Realistically speaking, if you want to have a good experience renting, you’d have to fall in love with the dress and it has to be the correct size. It May Not be all That Cheap – While wedding dress rentals are supposed to be very cost effective, if the dress you like is not that cheap, it may not save you much money to rent after all. Some bridal shops have gorgeous new wedding dresses for purchase at an extremely discounted rate which might be a better option since you’ll have more flexibility when you buy a dress. Ordering a Wedding Dress Online Can be Risky – Shopping online for clothes in general is a risk. There’s a chance of having an item shipped to you that’s the wrong color, the wrong style, or just doesn’t look as good as you thought it would. With your wedding dress, you want to avoid this at all costs. If you decide to order a rental online, examine the listing carefully, ask questions, read reviews, and make sure your sizing is spot on. Where Can You Rent a Wedding Dress? For my upcoming wedding, I chose to buy a dress since the price was affordable. I’m not really into designer brands, and I knew I would probably need a ton of alterations. I still don’t like that I had to spend hundreds of dollars on a dress I’ll only wear once, but I like that it was brand new, has classic style, and I have the option of selling it one day if I choose. If you are a budget conscious bride who favors practicality and would prefer to spend in other areas of your wedding budget, renting a wedding dress may appeal to you if you come across something you like. Try searching for bridal shops in your area that have a dress rental service before you shop online. Some online boutiques may even ship the dress to you to try on and allow you to return it if you’d like to go that route. When considering which option would be best for you, ask yourself what you are ultimately looking for and carefully weigh the pros and cons while being honest about what you can and can’t accept in a dress. It’s your special day after all, and there are plenty of additional areas in a typical wedding budget to save in. Would you ever rent your wedding dress? What would the biggest benefit or drawback be for you? If you rented your wedding dress before, what did you like or dislike about it?